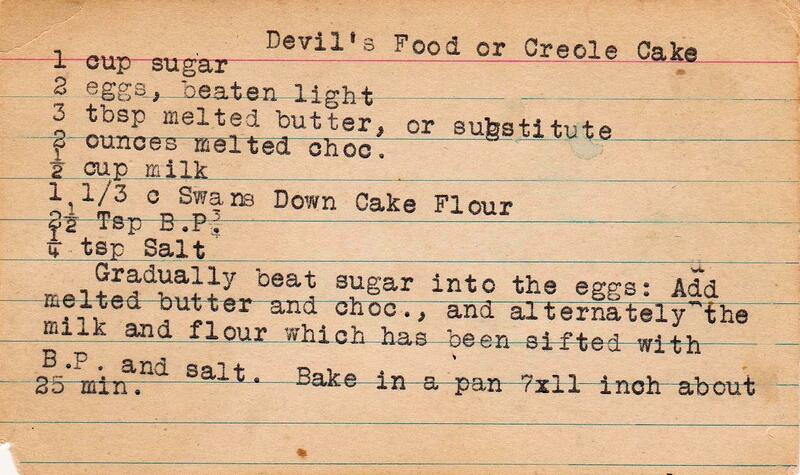 This is a very nice old-fashioned chocolate cake; like many made from mid-century recipes, it isn't overly sweet. And its smaller size (a single layer baked in a 7 x 11 inch pan) lends credence to the fact that portion sizes were smaller then too. It's also very quick and simply to put together. Don't be daunted by the pan size -- I've never even seen a 7 x 11 inch pan. Instead, you can use 9 inch round (or square) pan. Ready to take a trip to the past? Melt the chocolate over a double boiler (simply fit a bowl atop a saucepan with an inch or two of water to create a double boiler, but do not let the bottom of the bowl touch the water in the saucepan). Melt the butter at the same time. I do it in a measuring cup placed on top of my stove's pilot light. My idea of abstract art, below. This cake, as many do, formed a dome while it baked. You can slice off the top with a serrated knife to create a more uniform dessert. Not necessary, but the top makes a nice treat for the baker and helpers (and an opportunity to taste the cake before frosting, which is a good thing especially if the cake will be a gift.) If you make cookies, you can always taste-taste one, not so with a cake. I made my until now "foolproof" gravy icing for this cake. It was a total dismal failure, and I've launched a full scale investigation to determine why. Still needing to frost this baby and not having any butter softened (or the patience to wait for it, an exercise akin to waiting for paint to dry) I turned to an old-fashioned seven minute frosting recipe. I am not a fan of this once ubiquitous frosting, but I do like the bright white color. Unrelated to this post, I'm currently in a retro cake quandary. 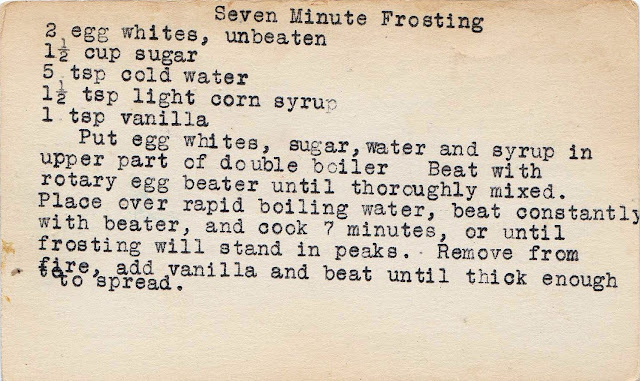 My boyfriend's grandmother, Sophie, used to make "green cake" around the holidays and it was (amazingly) his favorite. I want to try to make the famous green cake, but haven't yet found a recipe that looks right (Sophie didn't leave a recipe since she never needed one.) Pistachios were somehow involved, but I don't think pistachio pudding was -- intensely sweet pistachio flavor is not the DB's style. Have you ever come across a recipe for a loaf-pan style pistachio cake (golden brown crumb; greenish interior)? kkal -- I do recall seeing a "green cake" recipe fairly recently, though not sure it involved pistachios. I'll take a look in the next couple of days, all the while wishing I were more organized with these thousands of recipe cards. But will keep you posted!